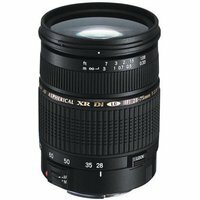 The Tamron SP AF 28-75mm f2.8 XR Di is a small, light and fast standard zoom lens that can be used comfortably as a high quality fast standard lens for silver-halide and digital photography. The Tamron SP AF 28-75mm f2.8 XR Di Lens utilises the same size reduction technology developed for the popular Tamron 28-200mm & 28-300mm Super Zooms. It offers a constant aperture of f/2.8 throughout the zoom range, making it suitable for use in low light environments.